Even when it all seems hopeless keep pushing forward. Like any other day in August, the sun is shining overhead with clouds sparsely dotting the sky above. Now, this is the type of weather you want to have when hiking anywhere in Oregon. Today my mom, her friend and I were going on a hike. The hike we were going on was the Eagle Creek Trail all the way to Tunnel Falls! A quick perusing of the Internet shows that it is only 12 miles round trip. How hard could that be? I postulate to myself. At 30 minutes per mile adding in breaks for photos and snacks, it shouldn't take more than six-and-a-half hours tops, maybe seven. We had gone up this trail once before to Punch Bowl Falls, which is about 2 miles one way. The day started later than previously anticipated as my mom's friend is a bit delayed with calls and such. No matter. I should mention now that I am wearing sandals which are actually quite comfy. It is almost high noon by the time we arrive. Not an ideal time since the parking area is packed with many hikers already whisking up the trail. The plus is that we will be in the shade majority of the time (think no sunscreen). It is a brisk afternoon with the sun illuminating the light-green leaves with a cool white glow. Not all the trees were green since the drought in Oregon was particularly bad. The poor lilies of the valley at home started dying in July and were completely withered by August. The maple tree was screaming at me for sunscreen and water while its leaves turned from yellow to brown and fell to the ground. Sad tree :(. Anyhow, anything not under some shade of a giant, arm-hugging Douglas-fir or next to a source of water was not doing so well. The grass is usually the first to brown, like a group of dancers without an audience to sustain them. They say that when you initially experience or see something that your perception of the event is slower than the second time you see it. I would say this held true hiking the first two miles of the Eagle Creek Trail to Punchbowl Falls. 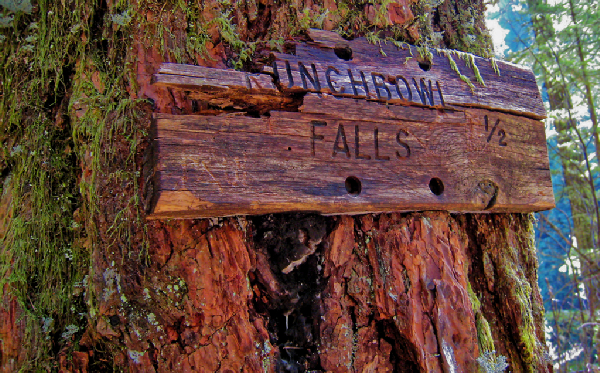 It did not take long to spot the decrepit Punchbowl Falls 1/2 mile sign. From then on it was an entirely alien territory. The High Bridge was our next big view and denoted our halfway mark to Tunnel Falls. With all this hiking, I was too exhausted to be in my right mind, creatively that is. We saw people down in the ravine below, wading in the river. There was a spot we could descend precisely on the other side of the bridge. Another adventure for another time. Had it not been for some research, I would not have known the name of the next falls that was just a wee past High Bridge. At this point, we decided to take a break at Tenas Camp. Fun, fun! We decided to head towards the general direction of the river to get a better view of Skoonichuk Falls (commonly misspelled as Skoonichuck Falls). I have no idea where that name came from. After climbing down some steep hills, we end up on a ledge overlooking the falls. There was some rope tied to a tree (maybe it was from these daring adventurers a year back). 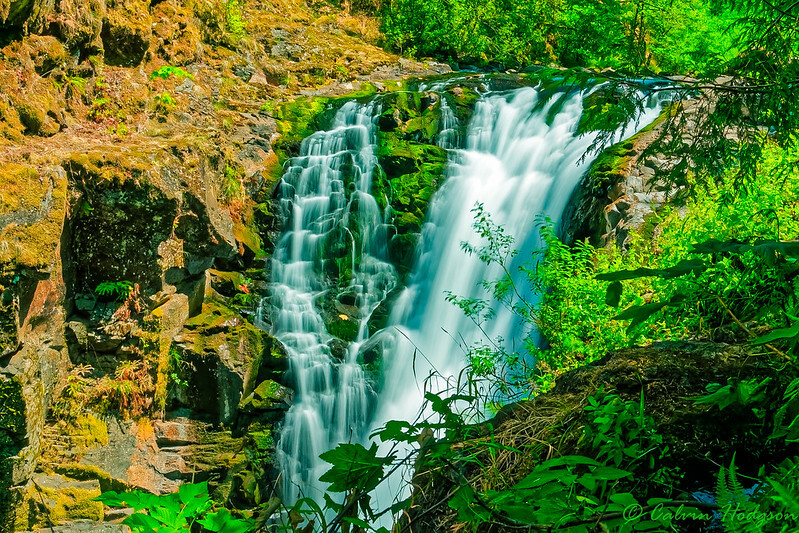 In either case, this is the only spot you can get a view of this stunning waterfall. Being in the heat of summer, there wasn't as much water cascading down as you would find earlier in the season. About another hour, and we make it to our next big landmark of this hike. The Four-and-a-Half-Mile Bridge (Again, wasn't in my creative mind so this video will suffice) is like something out of a fairytale. There's crisp clean water, sunlight dancing between the leaves and the soothing sound of the water trickling along. Another group that was ahead of us was taking a dip in its glistening water. We took a quick stop to dip our toes and snack on treats. Sitting there under the shade of the trees listening to the stream put me in a state of tranquility and serenity. Moments like that are but nil in our fast-paced lives going to and fro doing errands and completing projects. I have actually had one of these moments myself years back, even amidst the chaos of everyday life. It was a perfect day, in my book, with the breeze blowing slightly, the sun shining and the deep-blue skies gleaming. There was no agenda or task needing my immediate attention. That is how this moment felt..
Unbeknownst to us, a little chipmunk was skittishly peeking from behind the rocks; glaring at us before hurrying along. Once we had caught sight of it, we decided to throw it a peanut. Either it was hesitant or just did not notice it as it continued to peek at us darting between the rocks. Eventually, it braved up and ate the nut. What a cute little creature. After that encounter, it was time to make our way towards Tunnel Falls once again. As the day wore on; we inch ever so closer towards Tunnel Falls. A couple, who had already visited Tunnel Falls and were just heading back, informed us that it wasn't too far ahead. The distance seemd much farther then what they were saying. Our next landmark was a sign informing us of the fire that ripped through here many scores ago. Soon after that, we cross into another camp area. This one looked quite large, able to fit at least a dozen tents. A skip and hop away from there, we approach the boundary marking the Columbia Wilderness. A self-issue permit for our party needed to be drafted before proceeding along any further. This was likely needed in case we went missing as it identified where we were going. This part of the trail does not offer much in the way of waterfalls or streams. Any of that is in the valley below. The Potholes are a sign that Tunnel Falls is close. The Potholes aren't actually... well potholes. They are well-rounded rocks. They are interesting rock formations but not nearly as exciting as what was waiting around the next bend for us. At long last, we spot Tunnel Falls peeking through the trees. All other falls before this pale in comparison to its size. It's massive! Just looking down the steep hill into the amphitheater formed over the eons is enough to fill those with acrophobia with great trepidation. It is steep. So much so that there is a 100-foot long paracord rope to help ease those willing—and daring—to traverse down the steep hill to enter the massive amphitheater. The tunnel itself was flush with trickles of water; they softly patter against the rocky path below. I would reckon that minutes before our arrival, some plant lovers were smoking some herbs (weed). The entire tunnel reeked of it. I don't know why you would want to get lifted higher than Mt. Hood six miles from any car, but I guess the adventure only gets better when you are lit up. Puff puff pass. After going through the tunnel, we could get another spectacular view of the amphitheater and—of course—Tunnel Falls. Twister Falls was but another two-tenths of a mile further upstream, but we did not get the m-o for it. Another time, Tunnel Falls is the turnaround spot for most explorers. After spending some time admiring the falls, taking photos, etc., it was time to head back around. My mom heads down the steep hill aforementioned; her friend follows shortly afterward. My feet are barking. After such an exhausting trek, I passed going down today. Retreating back always seems quicker, this psychologically has to do with the fact the once new sights have already been gleaned upon, and that you are eagerly awaiting to connect to the Internet to play Clash of Clans (You aren't getting cell service this far out). Either way, things are all peachy for about a mile. 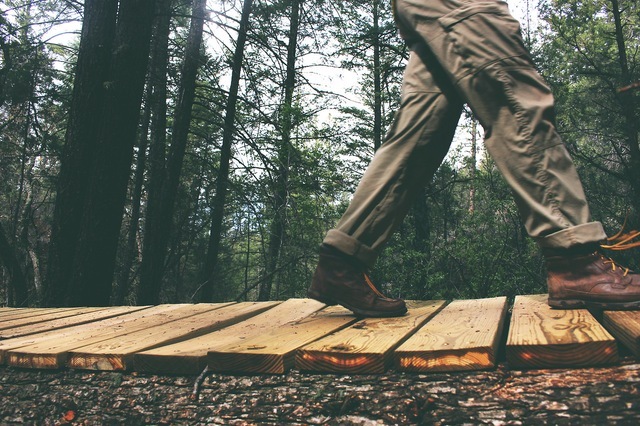 Think of skipping down the trail with birds chirping all around and bumblebees zooming past you as they grin from cheek to cheek. Okay, not that cheery. Well, maybe that cheery if you are baked like a cake as our explorers in the tunnel were. The time is 4:26 PM. Things were getting a little unbearable passing through the wilderness border. Not so much to hinder my progress but enough that it is starting to become a pain. I distinctly remember passing through the Wy'East Camp with the wide-open camp areas. The time is 4:53 PM. Based on the topography—and the fact that we were still on the east side of Eagle Creek—I know we would be approaching the Four-and-a-Half-Mile Bridge soon. Unfortunately, this is where I started to slow to a crawl. I began quickly falling behind. It really did not help to have one shoulder hauling a Lowepro Adventura 170 and the other a tripod. Mistakes were made. Making it to the bridge, I get asked if my legs are hurting. Yeah, one of them sure is. The other seems fine, for now. At this point, we rest our legs and cool off in the creek. Thankfully, it is the dead of summer, and the sun is still shining brightly, quite unlike our dreary winters. I have most assuredly lost track of the time at this point. Back onto the trail, the herd is slow moving heading towards our halfway destination, High Bridge. From here to Tenas Camp, all I can remember is thick, deep-green forest, the trail, and pain! Tenas camp, just four-tenths of a mile from our last resting spot, was another great place to sit for a while. I knew High Bridge was the next threshold to be crossed after this. We push off, and I acquire another big stick to help me dredge on. This one was a bit more cumbersome than the first I had gathered up around Tunnel Falls. Still, I would try it out. After many spurts and stops, I eventually toss the stick. It just wasn't working all that well. After another quick stop, I push on. Finally, High Bridge is in sight! I would have been filled with relief if this was the end of our adventure for today. However, we still had about three miles to the trailhead. Hardly an ideal hike given my condition. My other leg is wanting to give up, too. I know the next major points of interest after High Bridge is two bridges crossing over perpendicular creeks. Yippe! Time—in particular—seems to fly, at least in my memory, due to the lack of anything interesting along the way. As I languish along the trail, we finally make it to our first bridge of three left to cross. Another stop and cool off in the water for my sore legs. I think if you follow a steep portion of the hill near here, you can traverse Serpent's Tail Ridge to escape this valley of death and head towards the Pacific Crest Trail. The next portion of our slog will lead us to Punch Bowl Falls overlook, and the second of our three bridges needed to be crossed. Water was in short supply at this point, and our food was non-existent. Keeping this pace, we will surely perish out here! At some point, I was given an aspirin that worked with only moderate effect. I did not regain the spring in my step, but I could move with a bit more ease. This pain reminds me of the time I went to Seal Rock, OR for a field trip to poke at starfish and sea urchins in the tidal pools, then to the Oregon Coast Aquarium to grab slippery eels in the touch tank and pat manta rays. I never had such a brain-splitting headache ever until that day; not ever since have I gotten one so bad. It required downing two Excedrin migraines; one wasn't enough. Moving along, the sun is slowly creeping further down below the horizon. The valley we are in is already cast in full shadow seeing as there is nothing but gargantuan mountains on either side east and west. It was sure getting late and there was no end in sight for this trail. Getting past Lower Punch Bowl falls is a feat of strength. We have 1.7 miles to go. Summer in Oregon is just fantastic. Moderately hot but not too warm. No wonder droves of people from California move here. Lots of greenery and Voodoo Donuts! Metlako Falls sign was another welcome sight. It is not far now. I was lagging behind the pack significantly. I don't remember at what mile this happened since there is a lack of any mile markers anywhere, but I remember seeing a man jogging along the trail. Wow! If only I could do that, then this long, excruciating pain-ridden walk would be done in no time. The man soon disappeared around the bend. No one in front of me, no one behind. All in all, not bad. The light was quickly fading as sunset was upon us. I wouldn't want to be caught out in the dark without a flashlight or headlamp. Thinking back to the guy running, I got this bold, brazen—and quite frankly—crazy idea that I would run, yes run, the rest of the trail. I would wager I was about 0.3-0.4 miles away from the trailhead. Anyway, I ran as fast as I could, hoisting up my bag and picking up my stride. Maybe it was the sheer excitement of hauling it down the trail, the adrenaline pumping through my veins, or the pain medication talking, but I hardly felt any discomfort, not like what I felt moments before. The aching in my legs had simply vanished. Not too long, I was passing up my mom and her friend as I rushed by. I slowed a few times to catch my breath. By the time I had seen the small bridge that was just a tenth of a mile away from the trailhead, I was slowing back to a crawl. Mainly because my throat was parched but also because, after walking 12 miles, I was as spent as an M9 handgun. The pain was creeping back up my legs, like a spider slowly crawling its way up your pants leg. Creepy! Not too far into the future, I was greeted by my hiking compatriots. And after seeing many hikers pass, we had at long last made it to the trailhead. My mom and her friend were already making it back towards the main parking lot to save my sore legs from another harrowing walk. Did I mention I was wearing sandals the whole time? The time is 8:42 PM. Twilight was upon us. I chatted with a few hikers finishing off the trail as well. They soon left. It seemed like ages for pickup. In that time, I decide to pour out someone's soda, ants love sugar, that was left on a bench and slowly walk down to the end of this lot. This is when I started to notice quick shadows darting against the almost black sky above. The only other thing awake and flying at this time would be... bats! It had to be. Their silent zig-zagging in the air must have been their feeding time. I hoped they wouldn't feed on me! The car finally pulls up, and I hastily enter to the extent that my body would let me. Twelve miles, ten hours later, this was all done in over with. Now it was time for food. Seeing how late it was and how our stomachs were feeling empty and rumbling; we venture towards Cascade Locks, home of the famous Bridge of the Gods. We ended up at Bridgeside restaurant to eat burgers and fries. The pure black of night blanketed what view there would have been outside the windows during the day. Whatever, we were all happy to get something to warm our bellies after burning oh so many calories this day. Time to go home. In the next few days, I slowly recover. My legs are sore and aching; pushed beyond the limits of what they could handle. As a result of this haphazard incident, I carry at least one Excedrin with me at all times, and possibly an Advil liquid gel. Hey, when you get a headache or experience pain, you'll thank me later. I have also acquired a small shoulder backpack to carry an assortment of goodies and my camera. Some good trekking poles might likewise be in order to save my legs from long adventures. They will be all but crucial if going off the trail. 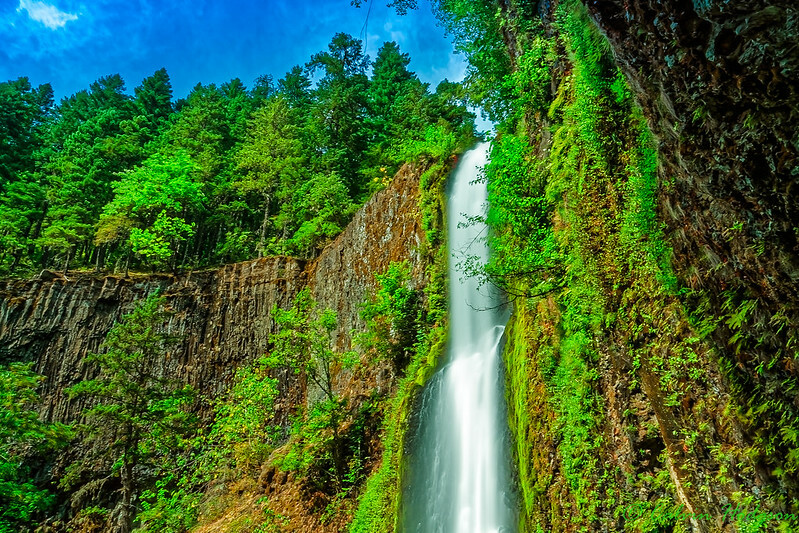 There is just so much to do in Oregon, especially around the Gorge. I can't wait to explore further its depths. For now, I wait for the warmer days.